SEVIERVILLE - The Smokies have announced that the team will be hosting a Free Beer Night presented by Bud Light on Wednesday, April 17, 2019 and a Pre-Easter Celebration on Saturday, April 20, 2019. 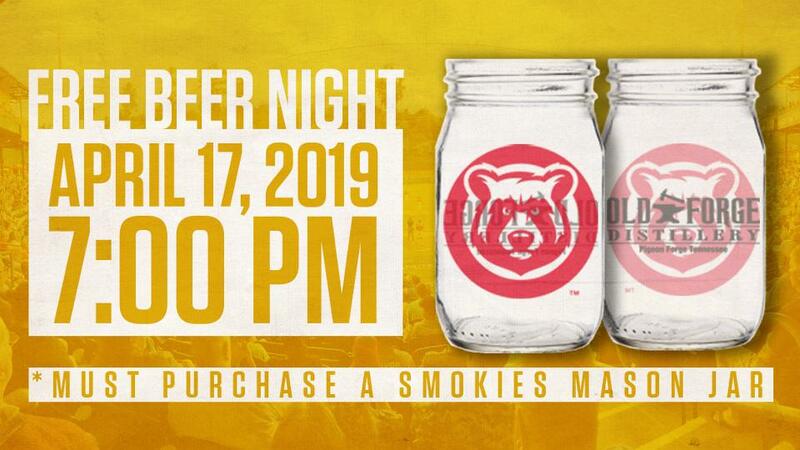 With the purchase of a ticket and a 2019 refillable Smokies mason jar, fans will be able to enjoy free draft beer from first pitch until the opposing team scores a run. Fans who have already purchased a mason jar during the 2019 season can reuse their mason jar for this special event. The free beer is only applicable with the 2019 Smokies mason jar. The Smokies will be facing off against the Jackson Generals for Free Beer Night with gates opening at 6:00 pm, and first pitch at 7:00 pm. Fans can enjoy the free beer special from first pitch (7:00 pm) until the Jackson Generals score their first run of the game. It will also be an All You Can Eat Wednesday where fans can enjoy their ticket to the game and all you can eat hamburgers, hot dogs, Bush's Baked Beans, homestyle mac and cheese, nachos, Uncle Ray's potato chips, popcorn, ice cream sandwiches, Pepsi products, and bottled water for just $19.99! The 2019 Smokies Mason Jar can be used for any other game during the 2019 season for just $4 draft beer refills, and $2 draft beer refills on Thursday night home games. The Pre-Easter Celebration will take place on Saturday, April 20 with a doubleheader beginning at 5:30 pm with gates opening at 4:30 pm. The game will feature an Easter Bucket Giveaway to the first 500 kids through the gates, presented by U.S. Cellular. The first 1,500 fans will receive a raffle ticket for a chance to win various prizes throughout both games. The full list of prizes includes a Grilling Package (YETI Cooler, Grill, BUSH'S Grilling kit, BUSH'S Picnic Kit, and a Cheerwine Corn Hole Board Set), Candy Package (life-size M&M figure and various M&M candies), 2 tickets to University of Tennessee Football vs. BYU and an autographed Jeremy Pruitt football courtesy of WVLT Channel 8, (2) rounds of golf for four people at Sevierville Golf Course, Dale Murphy Autographed Baseball, Trevor Clifton Autographed Baseball, Dillon Maples Autographed Baseball, Zack Short Autographed Baseball, Joe Nathan Autographed Baseball, Allegiant Air Travel Voucher, $100 Copper Cellar Gift Card, (2) 2-packs of tickets to the Q100.3 Windrock Park Shindig, (4) tickets to Zoo Knoxville, One-Time Family Pass to the MUSE, The Island Gift Basket, Tennessee Smokies Family 4-pack, (4) Tickets to Wonder Works, (4) Tickets to Hollywood Was Museum, (4) Tickets to Rocky Top Mountain Coaster, (4) Ripley's Attraction Passes, (4) 54 Ride Points Gift Cards to The Track, (4) Tickets to the Titanic, (4) Lumberjack Feud Tickets, $50 Pilot Food Marts Gift Card, $50 GoTeez Locker Room Gift Card, Rockstar LED Sign, and a Mountain Dew Camo Set. All of the prizes will be raffled off during both games of the doubleheader. There will also be an Easter Egg Hunt in between the doubleheader where kids will be able to participate on the field. The Smokies will also offer an Easter Retail special in the GoTeez Locker Room and on the Online Store on Saturday, April 20th and Sunday, April 21st. Fans can use promo code "BUNNY" to receive 15% off when you spend $85 or more. 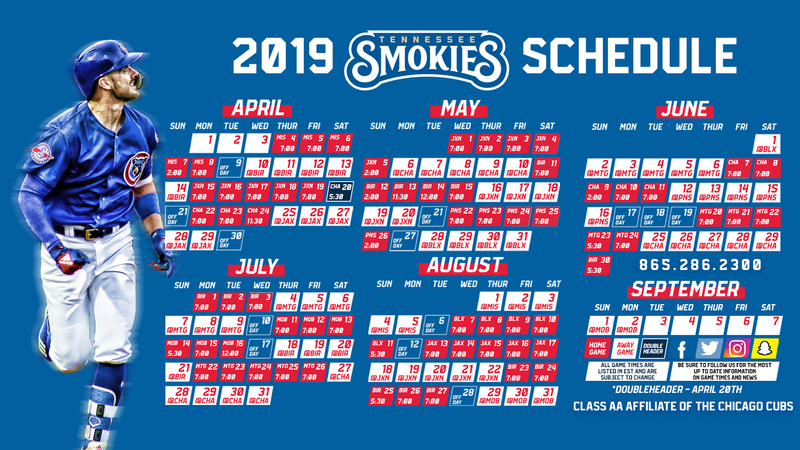 The Smokies continue the 2019 season on Monday, April 15th against the Jackson Generals at Smokies Stadium at 7:00 pm. For tickets and more information please visit www.smokiesbaseball.com.